What a great month for dining. I was spoiled this month. This time it was Lucca. In appreciation of my wonderful cakes last week, my BFF, Dari, took me out to lunch. Lucca has been here a few years, but I never ate a meal here. I had only come in with friends for drinks and their fabulous zucchini chips. These chips, by the way, are famous for Lucca. They are like those thin, kettle-style potato chips, but with zucchini! Sort of healthy? Let's pretend. Anyway, we arrived for a weekday lunch early and had our choice of seating. We opted for the patio, which was lovely. I will quickly mention that I love the street-side seating inside because they have the huge louvered windows that they can completely open up so that it's like being out on a patio. But back to the actual patio... They had misters going because it was expected to be 104. We also noticed the propane heaters mounted up on the ceiling for when the weather will get colder. There was a small fountain and it was all lovely except for the noisy bluejay. Bluejays and magpies, the noisiest birds in California. Our server was nice enough to offer us oil/balsamic with our bread along with the standard butter. I thought this was nice because most places offer one or the other and then you have to ask for the alternate if you didn't care for the first. (Got that?) She rattled off the specials, but we had already made up our minds from what was on the regular menu. Although I sat amused as she went on about the sole special as Dari's eyes glazed over. Dari will not eat seafood. 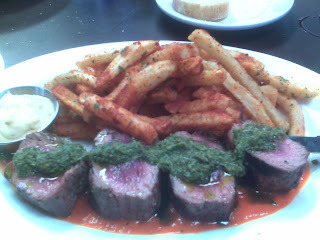 I ordered the grilled steak “ala Espanola” with spicy harissa, herb sauce and Spanish fries. I asked for medium rare and found that it verged right on rare, but not too much so that I couldn't eat it. The presentation, as you see, was lovely. The harissa is the red sauce underneath and is supposed to be pepper based. I was disappointed that it was really quite bland, as was the herb sauce on top. I thought that between the two it would be zesty and it wasn't. What saved it was that the fries had the zing because they were heavily coated in seasoning. 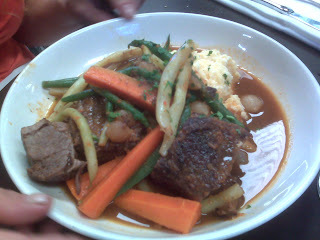 Dari ordered the braised short ribs with peas, carrots , pearl onions, mashed potatoes, except that she asked for polenta to be swapped for the potatoes. Nothing exceptional here, just an overall well done dish. Dari did swoon over the polenta. I've never been a fan of polenta. I think it's a texture thing. She said this polenta was exceptionally creamy and she really enjoyed it. I was pretty full and was gonna skip dessert (what?! ), but the server rattled off the gelato flavors and ended with the black raspberry cabernet sorbet. I was leery because I don't drink and so even the slightest taste of alcohol can set me off a dish. Dari said we should split it and I'm glad we did. I wouldn't have wanted a whole bowl by myself, but I still couldn't stop eating it. It was tart and sweet and the cabernet flavor was just a hint. Service was very relaxed, a little too much so. I lost track of time and ended up having a long lunch from work. Workday lunches in downtown should be at a faster clip. Otherwise it was attentive and yet unnoticeable, the way it should be. I look forward to trying Lucca again.